People around the world are using several kinds of smart phones. But from now on, even blind people can have a smart phone in their hand. These phones are especially designed by a U.K. based company named “OWNFONE”. Braille phones are designed in a 3D printed techniques in different colors and it can be customized. It comes in two choices: First in 3D printed keypad for those who know braille and second with raised text for those who don’t. Braille phone comes with very restricted tasks and can be used for basic communication as dialing up a call and answering a call. The device consists of buttons only, no screen. Each key for one no. and 12 keys in total. 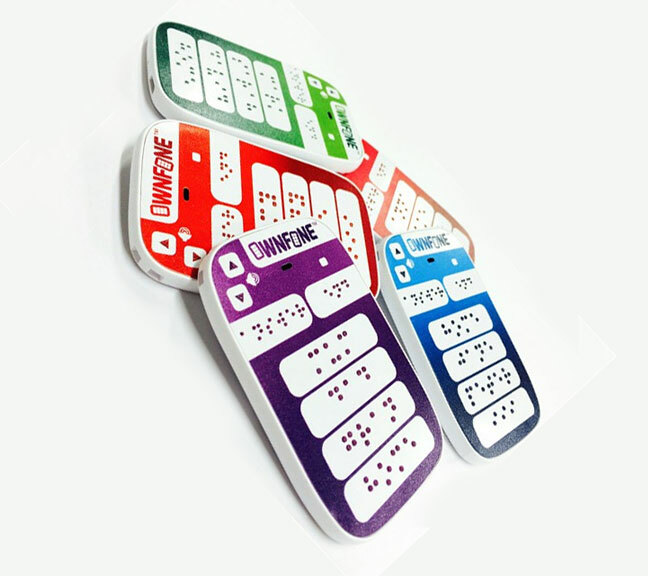 Ownfone’s new Braille phone was launched in 2012 in U.K. and it is followed by company’s “1st fone”. This phone is personally customized phone with braille buttons which are pre-programmed by manufacturer itself according to the details we provide. Braille phone can be ordered at a price of $60 and available in U.K.
Braille Phones are easy and ready to use device, no set up required for these phones. So by using these Braille phones one can stay in touch with his/her family members or friends. And Braille phones are ordered and can be personally customized as per users requirement.